– The control room really is a nightly exercise in crisis management but I never realized it until I started putting it into words by blogging. – The control room has only been a nightly exercise in crisis management since we began doing debate coverage. I suppose there may be a third combination but it's late and I'm too tired to come up with what that may be. Tonight's issue ... AC360 was originally supposed to be on the air from the end of the Democratic debate at 9:32p until 11:00p. Then we got word they were extending the debate (Great call in my opinion. It was really interesting to see Hillary and Barack go one-on-one.) so we'd get it at 9:40p. Then 9:50p. We finally took over at 9:52p. But even though we had lost twenty minutes of air time, we still had the same number of really smart, really interesting guests and how do you just randomly pick one or more of them to cancel at the last minute? We didn't cancel anyone but it was a mad scramble to figure out how to make it all work timewise. The good news tonight was that with Anderson back in New York we had no trouble with the prompter! To answer someone's question from one of the blogs ... yes, on nights like tonight there is some yelling in the control room. But no one takes it personally and we also still made time for a few laughs. A friendly reminder: Catch CNN’s final debate before Super Tuesday! As I have traveled around the country, it seems everyone is concerned about health care. More people than not think the system needs a major overhaul. An estimated 47 million Americans have no insurance. For others, it's an enormous financial burden. Families USA, a non-profit focused on affordable health care, predicts 18 million Americans under 65 will spend more than a quarter of their family income on health care this year - and that's before taxes. And for some, the costs of medical care are catastrophic. It's the Number One cause of personal bankruptcy in the United States. So what are the candidates proposing to do about health care? Democratic candidates Hillary Clinton and Barack Obama each promise they'll provide access to health care for everyone. They would do this by expanding coverage for children and Medicaid for the poor. Also, they'd require most companies to offer insurance to their workers. The big difference: Clinton would require everyone who wasn't covered by work or the government to buy their own insurance. Obama says that's unfair because buying your own insurance is so expensive. As a result, Clinton claims Obama's plan would leave out 15 million Americans. Both agree: they do not want a government run system like Canada or several European countries. In the interest of full disclosure, I was a White House Fellow, a non-partisan appointment, in Hillary Clinton's office in 1997 and 1998 – three to four years after her health care initiative had been defeated. Republican candidates (Watch Video) say the Clinton and Obama plans are too expensive and would add red tape to already-large bureaucracies. They're proposing a different approach. They want to increase competition among insurance companies to bring down the price of health care insurance. They also want to give individuals who buy their own health insurance tax breaks. In short, they want to use the power of the marketplace to make health care more affordable. The challenge for the Republicans, of course, is what to do with people who still aren't covered? So, which do you think will work? Using the free market and enterprise or expanding existing programs to cover everyone? Programming note: Watch "Broken Government: Health Care – Critical Condition" tonight at 11 ET on CNN. The hour also airs at 11 p.m. SundayEditor's Note: Medical news is a popular but sensitive subject rooted in science. We receive many comments on this blog each day; not all are posted. Our hope is that much will be learned from the sharing of useful information and personal experiences based on the medical and health topics of the blog. We encourage you to focus your comments on those medical and health topics and we appreciate your input. Thank you for your participation. "John, I don’t think now is the time to rehearse for 'Dancing with the Stars…' He's asking you a question!" So here it is — ready for today’s challenge? For those of you who don’t know, we’ve started something new — Beat 360°. These are intoxicating times for presidential pundits. Sounding more like boxing commentators than political analysts, they have been busy discussing last night's battle between McCain and Romney while speculating on the "Thriller in the Manila" Obama/Clinton showdown set for this evening. The GOP candidates take the stage for Wednesday's debate. All the fight talk is fun. But it misses the big picture. I can't recall an election year when the political parties and their candidates have been so divided on key issues that matter to all Americans. True, McCain, Romney and Huckabee clash on certain details - but they have much more in common with each other. They agree that abortions should be banned, all support the war in Iraq, praise Ronald Reagan, and believe only justices who strictly interpret the Constitution should serve on the U.S. Supreme Court. The Democrats see the world in a much different way. They are pro-choice, oppose the war and think justices like Roberts and Alito are all wrong for the high court. Yet, both sides make promises about bringing the nation together. Saying they can unify the country. Make it whole again. After the Iowa caucuses earlier this month, The Wall Street Journal did a poll asking about Clinton, Edwards and Obama. Then they did something interesting: they took Edwards out of the equation, just as Edwards has now done himself. Former Sen. John Edwards ended his presidential bid on Wednesday. What happened? Clinton and Obama both picked up five or six points. Will we have a split decision now, too? Maybe. But a lot has happened since that poll. Pro-Obama types say Edwards voters are "change" voters. Ergo, Obama voters. But you might get a different answer if you look at Edwards' base of support. They tend to be less educated (less than the average Obama voter, anyway), rural, working class, union. That sounds like Clinton voters. Now, Edwards had said he was in the race until the convention. So what happened? Elizabeth Edwards was instrumental in his decision to get into the race, and to stay in the race after she was diagnosed with cancer. And she was instrumental in this decision, too. Why did he drop out now? After the South Carolina primary, where he underperformed, Edwards went home to North Carolina on Sunday night. Monday, they had a big strategy (conference call) meeting in camp Edwards. They talked about how they could pick up 200 delegates on Super Tuesday, where they would go to do that. All the strategists and top aides came away from that thinking, OK, full throttle. But on Tuesday, "something happened." His advisers tell me it was "organic." Edwards went with his "gut." He talked to Obama and Clinton and said he was thinking about dropping out and would they pledge to make anti-poverty a part of their campaign agenda? Yes. And it was over. No big meetings, no grand strategy session, aides say. Just Edwards, who called his top people and told them, "Here's what I'm doing." The loneliest time of any campaign. Breaking news....the Morning Buzz guy has the flu!!! SO for today's headlines go to CNN.com. Back soon...I hope!!! At presidential candidate debates, the stakes are high for those on stage and those behind the scenes. Our New York control room picked up coverage when the Republican debate at the Reagan library ended. The handover was particularly tricky because we weren't swapping out anchors. Anderson did both the debate and then our post-debate coverage. You would think that this would make it easier, not harder, but it presents a new set of challenges. Here's one of them. Usually the line of copy in the prompter that the anchor is reading is in the middle of the screen. To account for a normal satellite delay we were rolling prompter off the top line of the screen, in effect leading Anderson. And yet, this was still not working as Anderson had to wait for copy to catch up to him. All this was happening while we were live on the air. Anderson soon resorted to adlibbing (which is very impressive, I might add, considering what was at stake) until we figured out that we needed to be three full lines of copy ahead of him. What he was reading in California was already off the screen in New York. The person running prompter in New York, JoAnn, was essentially doing it blind. Not ideal. Or easy. But we made it work. Like the candidates on stage at the debate, our performance wasn't flawless but hopefully it kept you watching. What was Wesley Snipes thinking? The multimillionaire movie star paid no taxes – none at all, didn’t even file returns – from 1999-2004. Now on trial for tax fraud, his lawyers concede he must pay millions of dollars in back taxes, penalties and fees, but they claim no fraud took place because he was open in his refusal to pay. 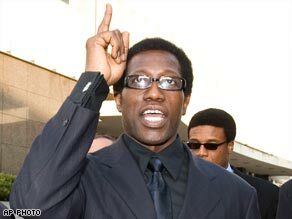 Wesley Snipes makes a point. Reminds me of Michael Vick. A man at the top of his game, who had it all, and who threw it all away for illegal behavior that is incomprehensible to most of us. He risked losing his high-flying NFL career over . . . dog fighting? Wesley Snipes. Riding high as a worldwide film star, who risked his reputation, wealth and freedom to . . . join a merry band of tax avoiders? Guys who claim the IRS has no jurisdiction over wages earned in the U.S.? Check out more Lisa Bloom blogs on "In Session"
We learned today that John Edwards was dropping out of the presidential race, leaving just the two bitter rivals , Barack Obama, and Hillary Clinton, to fight it out for the democratic party’s nomination. Despite his populist ideals, Edwards was never popular with voters during the primary season. And although he insisted he wasn’t going to withdraw, he did. But why? A source tells CNN the decision wasn’t about money. We’re being told it had to do with the reality of not having enough delegates after Super Tuesday. We’ll find out more when he makes his speech in just a little while. As for the republicans, another shake-up, but one not as surprising. Like Edwards, Rudy Giuliani is also exiting the race. Not too long ago, he was leading the GOP pack. So what happened? What’s behind the former front-runner’s spectacular decline? We’ll have our panel offer their explanation this evening. Meantime, share your thoughts with us about Edwards and Giuliani.